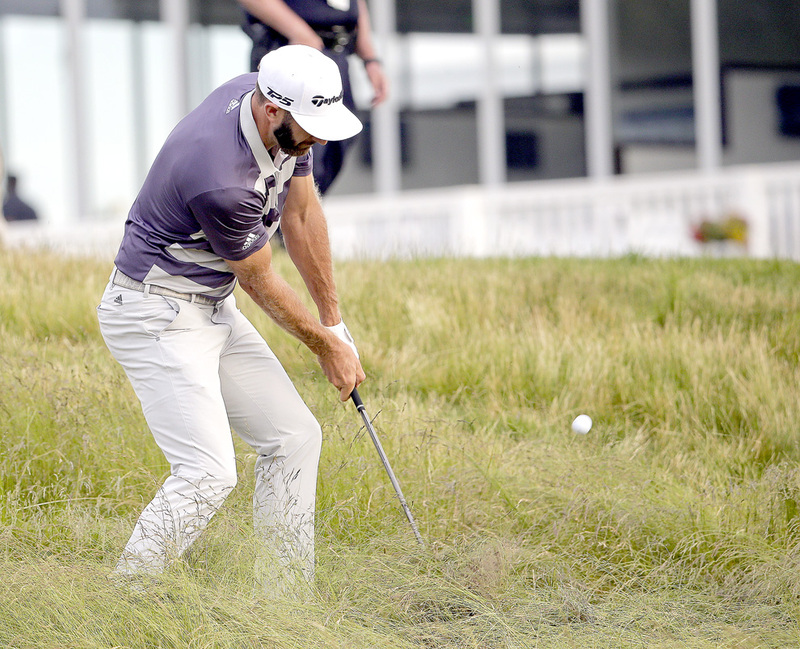 SOUTHAMPTON, N.Y. (AP) — The only thing that spared Dustin Johnson from another U.S. Open implosion is that everyone around him suffered on a Shinnecock Hills course that even the USGA conceded got out of hand Saturday afternoon. Daniel Berger and Tony Finau were the exceptions, each posting a 4-under 66 before Johnson hit his first shot. The world’s No. 1 player faced greens that felt like putting on glass, so slick that Phil Mickelson swatted a ball while it was still moving on the 13th green. No one in the final 22 groups broke par. Johnson, who started the third round with a four-shot lead, barely nudged his 17-foot birdie attempt on the 18th hole and watched it roll — and roll — 8 feet by the hole. He missed the par putt and signed for a 77 to fall into a four-way tie for the lead. Mickelson brought plenty of attention to the 13th hole, where anything that ran by the cup was headed off the green. Worst yet might have been No. 15, where players hit putts by the hole only to watch them roll all the way off the putting surface. Koepka hit an approach to 15 near the hole, and it moved a few inches to the right, and then a few more feet, and soon it was in a bunker. Berger and Finau, who started the day 11 shots out of the lead, will play in the final group. Finau and Berger never have played in the final group at a major. “I’m going to find Mike Davis,” Pat Perez said after signing for a 77. “It’s the U.S. Open. It’s supposed to be hard. When is enough enough? It’s not about hard. There’s no other tournament where you see the guys putt off the greens.